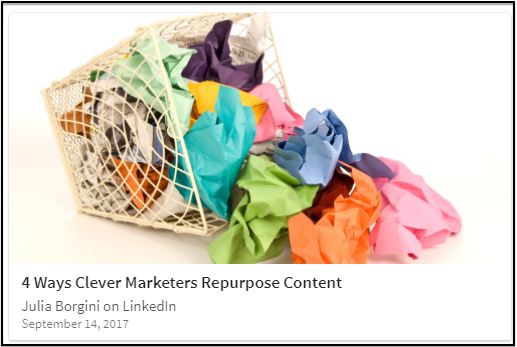 Repurposing content doesn’t have to be an overly complex process or activity. Simply take a good quality piece of content and see how you can transform it. Take a podcast and turn it into a checklist and blog post. A series of blog posts turns into an ebook you can use as a lead magnet. All of these ideas are well and good, but what about the tools to actually produce these different kinds of content? What if you don’t have the right tools to repurpose your content? Fear not, you don’t need as many expensive tools to repurpose your content as you might think. There are tools out there you can use right now to repurpose your content into something valuable for your audience. Take a look at these 8 tools and see how you can use them to make repurposing content easier. Want to create a new presentation? Look no further than your corporate blog. Take a few of the posts on a similar topic, add it to a branded presentation template, add your social media handles, website URL and other links and you’re good to go. Upload the presentation to SlideShare and then share the link to your audience. Canva is one of my favourite tools to use and it’s free! You can create some powerful graphics for any of your content, such as Twitter posts, Pinterest images, banners, brochures, and more. Use it to repurpose one of your How-To guides or checklists into an infographic you can share on social media. Use the free images found through Canva or try some of these great royalty-free stock image sites: Pexels, Pixabay, and StockSnap. Then take the infographics or images you created in Canva and share them on Pinterest. Turn visual-heavy blog posts and presentations into single images on Pinterest. Use all of these to drive traffic back to the original blog post or download page. Video is very big right now with content marketers, but you don’t need to produce a slick, long-form video for it to be effective. Jay Baer of Convince and Convert produces some amazing short videos of content marketing tips and publishes them on the JayToday.TV site. He films the short videos on his iPhone and then publishes them to a YouTube channel (a gallery managed by Vidyard). If you host tweet chats or live tweet events, then Storify is for you. Use it to gather all the relevant tweets and then publish it on Storify. You can share the collected tweets via social media, embed it on your blog, and more. Expose your content to a new audience by sharing blog posts on LinkedIn. Share with your connections or the public and you’ve just opened a new audience for your content. Take an existing blog post or report and summarize it on LinkedIn Publisher. Link back to the original content on your site and then hit Publish! Create a curated list of your best content with a “newspaper” of your very own. Paper.li is an online tool that centralizes your content curation, which you can then use to spread the word. Share the Paper.li link with your best content in your email signature, gather your content by subject area and then publish the feed. Yep, good old email is still a great place to repurpose your content. Take the checklist you published in an eBook and send it out to your email list. Or create a list of your most popular blog posts and send it out to your email list. Or take the main image from your most popular pin on Pinterest and send it to your list with a link back to a relevant report or blog post. You get the idea. The key for successful and effective repurposing is to strike a balance between maximizing your reach while you retain your content’s integrity. These tools will help you do that as they’ll have you repurposing your content more easily than you thought possible. Pair these tools with a few processes and you’ll be optimizing your content repurposing activities in no time.